BARRING A LAST-MINUTE SURPRISE from Hurricane Earl, this should be a delicious holiday weekend for picking apples across New England. The forecast is for sunny weather Saturday, Sunday and Monday, with daytime temperatures in the 70s throughout most of the region. Depending on your location, you may get to pick the season’s first McIntosh apples. They are running a week to 10 days early in most places, so you can get a head start on New England’s favorite apple, just in time for school lunches. 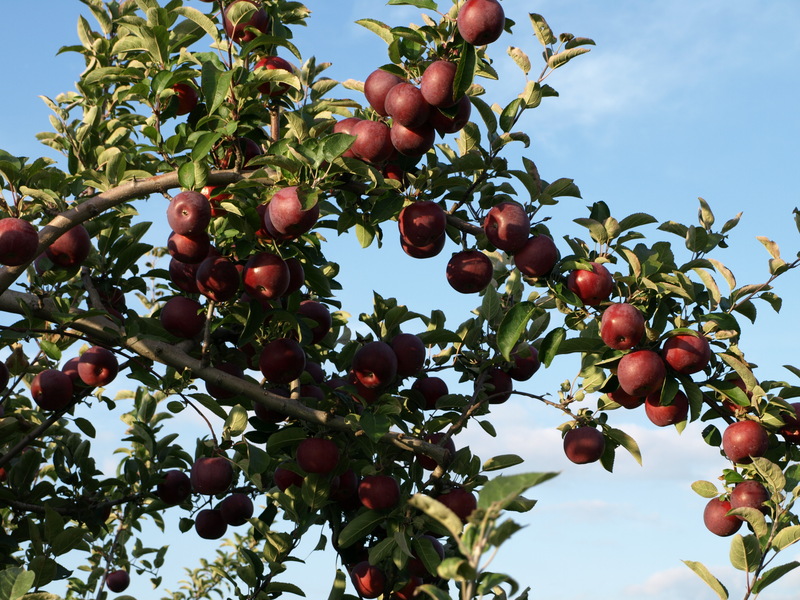 If the Macs aren’t ready for picking at your favorite orchard, there should be plenty of other early varieties to choose from. You can call ahead to find out what’s being picked. Overall, it is shaping up to be a good New England apple crop. Total volume region-wide is down about 17 percent, the result primarily of frost damage in late spring, particularly in the northern states. But you won’t notice the shortage this fall, if at all. Early reports indicate that New England’s apples are especially flavorful this year and that they are in abundance and of good color and size. A day in the orchard is a powerful experience. The lush fruit hanging from the tree, the sweet aroma of apples in the air, and the gentle background sounds of honeybees and insects combine to flood the senses. You’ll feel calmer for the experience, and bring home some of the freshest, healthiest, tastiest food you can buy, with the satisfaction of having picked it yourself. But don’t take our word for it. Discover the pleasure of apple-picking on your own. THE 2010 NEW ENGLAND FRESH APPLE HARVEST will be celebrated Friday, September 10, in a daylong event around the region. Beginning Friday evening through the weekend, the New England Apple Association and Massachusetts Department of Agricultural Resources will sample apples and give away recipes, brochures, and other educational materials at a booth at the Sterling Fair. The fair’s hours are Friday, 5 p.m. to 11 p.m.; Saturday hours are 9 a.m. to 11 p.m.; and Sunday, 9 a.m. to 5 p.m.
Commissioner Soares and Powell will give a presentation on New England apple varieties Sunday at 11 a.m. Details about events in the other New England states to follow!